This desktop stand from Aidata is designed primarily as a bookholder but can easily be rotated into a vertical copyholder. 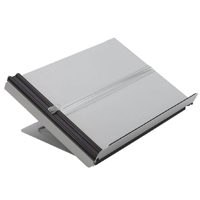 Two adjustable page holders expand to accommodate thicknesses up to .75", keeping books open to the desired location. The 10" wide book ledge extends a full 1" from the middle and tapers back from that point. 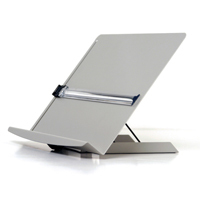 A convenient rotating stand permits an exceptionally wide range of viewing angles in both book and document orientations and the large, anti-slip rubber ball feet ensure stable positioning at all angles. While not designed specifically as a copyholder it does have clips incorporated both top and bottom which enable users to insert and securely hold thinner documents. 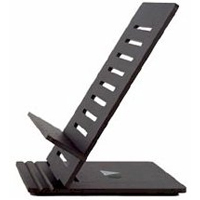 The Atlas Ultra book holder from Dainoff Designs is a portable version of the Standard Atlas Book Holder. The efficient design of the Atlas Ultra means that it can serve well as a document holder, a book holder, or even as a tablet or laptop holder. 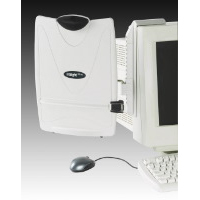 This makes it a versatile accessory for any workstation. The Atlas Ultra has two fixed settings of 15° and 30° off the vertical, permitting users to choose the viewing angle best suited to their work and height. The modular designs means it can easily be assembled and disassembled in 30 seconds. In order to create this more compact version of the Atlas Book Holder the Atlas Ultra is machined from high density rigid Trespa or Formica. Two short and two long metal dowel page stoppers (not shown) are included to ensure that books and binders stay open at the correct page. The height adjustable shelf features 22 stopper holes in order to accommodate the widest range of books and documents. Can be combined with other VuRyte monitor risers (VUR-2455, VUR-4855, & VUR-4800) for monitor elevations greater than 1"
Easel expands to 11" in height and collapses to 6"
Monitor riser base is 11.25" x 11.25"
The Insight Plus Monitor Mount Copyholder holds documents at eye lever and has a height adjustable bracket that fixes to your monitor using special adhesive pads. 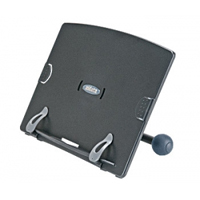 It can be mounted to either side of the monitor for flexibility. Holds up to 50 pages of A4, letter or legal paper. The movable line guide which can be fixed on either the right or the left, is useful for pinpointing specific information. When not in use it swings neatly out of the way. 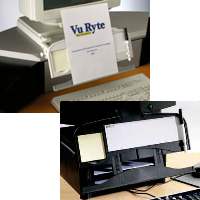 Allows positioning of documents at eye level to help reduce neck strain. Saves valuable desk space and your neck by getting documents off the desk and at eye level. 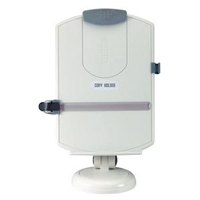 Provides height and angle adjustment for personal viewing comfort, and rotation from portrait to landscape positions. Also includes a sturdy paper clip, a sliding magnified line guide, and a detachable faceplate that can be used as a clipboard. Fully adjustable tilt and swivel for personal viewing comfort. 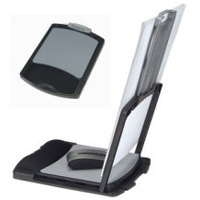 Weighted base provides steady support and stability of copy holder. Includes adjustable clip for different paper sizes. Built-in flexible line guide, pen holder and front page clip. Easel is 13" high by 9.25" wide. 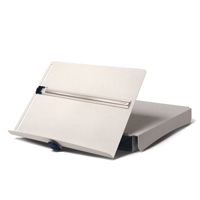 The INZONE Documentholder III from Sun-Flex is a sturdy, solid metal freestanding document holder with 8 inclination options from 0° to 64°. It includes a plastic line guide with magnifying feature and expanding aluminum line guide track which securely holds reference material from a single sheet to a 0.9" thick stack of paper. 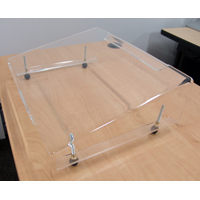 A foam strip along the ledge of the tray prevents books and larger materials from moving unintentionally on the easel. The construction of the INZONE Documentholder III is of high grade, heavy duty steel sheet metal and painted with a matte powder coating silver finish to avoid reflections.